Home » BERITA » PNG Piji AND SHOULD CONSIDER APPLICATIONS SUPPORT FOR INDONESIA Melanesian. PNG Piji AND SHOULD CONSIDER APPLICATIONS SUPPORT FOR INDONESIA Melanesian. Submission of an application to become a Member Indonesia officially MSG only hinder efforts ULMWP application. Indeed Malanesia Indonesia Indonesia uses the name to become a full member of MSG is not appropriate because Indonesia is not a race Malanesia. Indonesia claimed that, they filed an application to represent five provinces is not true because of Maluku and North Maluku Malanesia not race. Two provinces of Papua and West Papua people of Papua gave the legitimacy to ULMWP. Prime Minister of PNG and Fiji should consider support for applications Malanesia Indonesia. If PNG remain supportive application will destroy Malanesia Indonesia. Southeast asia strength in Malanesia destroy Malanesia of economic trade of natural resources. 4 countries Malanesia only a small island, while the large island just West Papua and PNG if climate change or global warming small islands to save people drowning in the Pacific would Malanesia below where if today does not survive west Papua. On the other hand FPI continues to threaten to take control of west Papua Papua, Indonesia Papua If the west will easily destroy Malanesia. PNG and Fiji today must understand this, because ULMWP Applications submitted an application to save Malanesia. Because of west Papua today should dispel asean economy trying to master Malanesia. PNG and Fiji do not have to bother with Indonesia Malanesia application or Melindo. To save the integrity Malanesia means should thank west Papua became a full member of MSG. 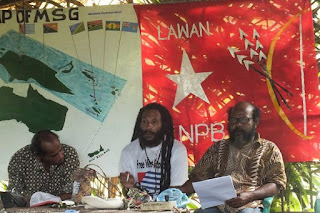 Indonesia applications only to dispel the west Papua became an official Member of MSG, and it also shows the attitude of occupation and klonialismenya in West Papua. If the PNG and Fiji refused west Papua dishonorable means rejecting siblings who are currently going back to the family home or bladder. Means destroying Malanesia and provide opportunities for master Malanesia southeast asia.